WHILE millions of men throughout the world have been frantically engaged in destructive warfare waged by new and secret devices, during the last few years, several hundred earnest American scientists have been just as busy training an army of their own and perfecting a weapon which may go a long way toward making a better civilization tomorrow. The army of the scientists is an army of electrons, countless billions strong. The weapon is the electronic tubeâ€”no secret weapon, to be sure, because among the common types are the tubes in your radio. If these electronic soldiers wore uniforms, the uniforms would be overalls, for America’s research geniuses are just learning how many novel and super-human tasks can be performed by the docile little workers, so tiny that an electron is smaller, compared to a grain of sand, than is the grain of sand compared to the whole earth. So feeble that a dim beam of light can push them around, these electrons are so powerful when put on the job in vacuum tubesâ€”some tubes the size of a peanut shell, others the size of a manâ€”that they can start, stop and otherwise operate industrial machines weighing hundreds of tons. Their versatility is shown in the General Electric plant at Schenectady, N. Y., where a tube is manufactured that can detect one-quintillionth of an ampere, while other tubes are being made that will pass a peak current of 15,000 amperes. Many jobs now performed by electrons in overalls formerly required one of the human senses such as sight, hearing and touch and the proper response by hand or foot, but did not really require a brain. The phototube, microphone, and thermocouple can now replace the eye, ear, and sense of touch, and other vacuum tubes form the “nerve system” to transmit instructions to other electrical devices like motors and magnets, to act in place of fingers, arms and legs. A remarkable example of their efficiency is provided in the manufacture of steel for tin cans which is now produced in strip at high speed, and reeled. The resulting rolls are pulled out and cut into squares to be tin-plated. The strip goes through a pin-hole electronic-tube detector. Holes over fifteen mils are “detected,” but nothing is done about it right then. The strip goes through a thickness gauge and any part over .0003-inch too thick or too thin is detected, but again nothing is done about it at the moment. Now the strip goes through a shear and is cut up into sheets that stream away on a conveyor. Just at the critical moment the control remembers some holes and a trap opens in the conveyor and the bad sheet falls through into a cart. The control also remembers a thin spot, so another trap opens at the proper time and down goes the thin plate. The same occurs at another trap if a thick spot were found. At the end of the conveyor a phototube counts the surviving sheets. Every time ten sheets have passed, the frame on which they are stacked is moved an inch. After the next ten it moves back an inch, resulting in a pile in which each ten sheets is offset for easy pick-up for annealing. The average American is best acquainted with those infinitesimal toilers-in-tubes in connection with radio, television, telephone and other means of communication. Some have seen how they open and close doors, start and stop elevators, check traffic on highways, count, sort and inspect packages, switch off and on city lights and measure illumination for thousands of camera users. They know that geologists dispatch battalions of electrons from a miniature portable broadcasting station down into the earth and some of them come back to report the presence of metal among the rock and sand formations far below. Other electronic tubes indicate the location of oil pools. 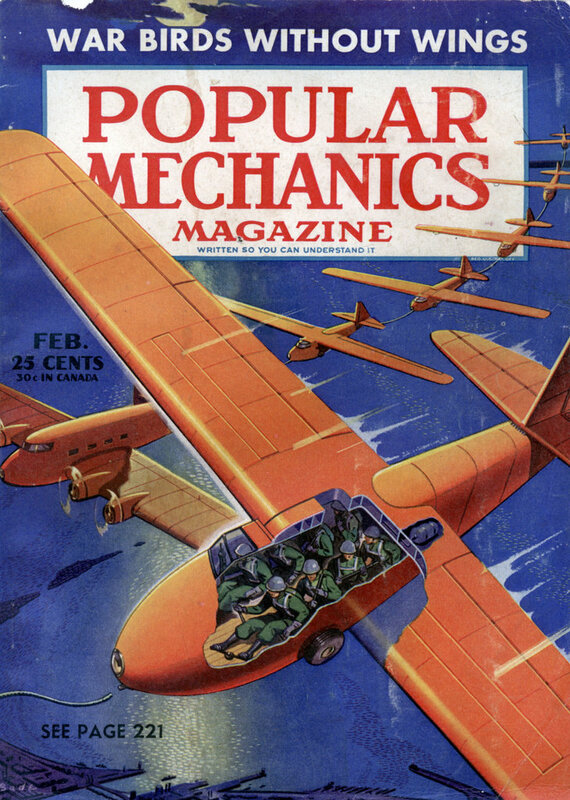 Many realize the roles they have played detecting submarines and airplanes, in aiming guns, in forming beams to guide planes to safe landings, in advising fliers just how high they are flying over a mountain and in heating tissues and speeding up blood circulation while streaming into the body in the form of health-giving short waves. Not so well known is the fact that these same health-giving short waves are being employed in packing plants to kill the deadly germs of trichinosis in pork. And relatively few are aware that electronic tubes will “frisk” visitors to a penitentiary by revealing the presence of metal on a person passing through an electromagnetic field, or that by magnifying the slightest sound in a closed building or vault the lightest footfall of an intruder can be broadcast to a watchman like the beating of a huge drum. Known to comparatively few, also, is the increasing part these electrons in overalls are taking in assembly lines, reducing costs, hustling output and improving products and processes. Electronic tubes in factory chimneys give instant warning if smoke thickens, indicating a wasteful fire; others sort cigars or match colors in fabrics and paint samples. Coffee, corn flakes, face powder, toothpaste and dozens of other common products are tested for uniform color by these little electrons in overalls. Thermoelectric sextant detectors can peer through fog or clouds and register the warmth of a man’s face a mile away. They are aiding ships to avoid icebergs. A cotton picker is regulated by electrons in overalls which instruct the mechanism to reach only for the bolls which are white and therefore ripe. Other tubes stop and start conveyors, detect fouls in bowling matches, run dumb-waiters, weigh cement and baking powder, inspect storage-battery parts and warn of paper breakage on printing presses. Used in X-ray devices, they spot flaws in castings and weldings, show up foreign particles in packed candies and peanuts and bone splinters in prepared hams. And now, a whole new field has been opened by experiments with an electronic device which probes the action of the brain, just as the geologist investigates interior strata of the earth. The very process of thought itself may be measured by the electronic reaction it sets up. Another school of medical research is having success in locating brain tumors and diagnosing similar disorders with electronic-tube devices. A revolution may be impending in the study of virus diseases which some believe are caused by germs too small to be seen by the most powerful microscope. Researchers are speeding their experiments with microscopes activated by electrons in vacuum tubes and responding to light waves invisible to the eye. They are satisfied these little toilers can unfold secrets long concealed from mankindâ€”perhaps the secret of life itself. And, finally, another group is hard at work to make practical use of another discovery that may have far-reaching effect on human existenceâ€”the conversion of sun rays into work-a-day electricity through electronic tubes. It not only can be done, but actually has been done. The problem remaining is production in quantity.